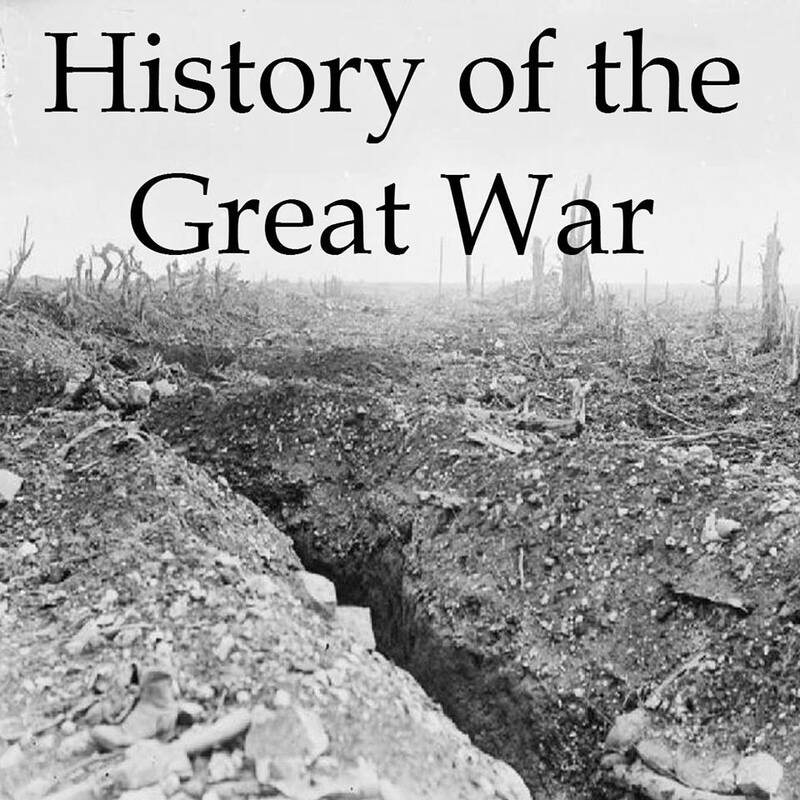 History of the Great War is a weekly podcast that will cover the First World War that occurred from 1914 and 1918. Every week we will be discussing the events that occurred exactly 100 years ago. We will journey from the borders of France in the blistering heat of 1914, to the shores of Gallipoli, to the banks of Somme, to the final knockout attempt by the German army in the spring of 1918. Of all of the military arms that took part in the war the cavalry is perhaps the most ridiculed, but is that a fair assessment? iTunes RSS The History of the Great war is also available on Stitcher and SpotifySourcesBritish Cavalry on the Western Front 1916-1918 by David. . . In the past I have added items to the Sources page instead of making a separate post, but at this point the Sources page is very long so I thought I would make a separate post for this year's very large update. Below are most of the sources for the. . .
We come now to the end as we chronicle the last days before Germany signed their treaty.. . . The most discussed feature of the German treaty was the details of the expected reparations.. . . Many topics were discussed at the Paris Peace Conference, none were considered more important than what to do about Germany.. . .
Alone of the countries that had entered the war against Germany, Russia was not invited to Paris. In this episode we discuss why.. . . Between Bolshevik Russia and a defeated Germany the Poles were trying to create a new country, and they it would be a long road.. . . There were many countries trying to carve out their own place in post-war Eastern Europe.. . . The war had started with an ultimatum to Serbia, Serbia would also be there when it was over.. . .
Nobody knew what to do with Austria and Hungary, because they were Austria-Hungary, but then they weren't. . . The Mandate of Palestine would be given to the British, and they had some big promises to keep.. . . In this second special episode we continue our look at the medical side of war with a special focus on neurosurgery.. . . In this special episode we discuss medical care during the war.. . . While the delegates in Paris debated the future of the Ottoman Empire, in Anatolia they were taking matters into their own hands.. . . The Middle East would be broken up between the British and French, but they had some problems determining exactly how, and then keeping control of their new territory.. . . In our first episode about how the Middle East was handled at the Conference we need to talk about what mandates are and how they were applied all over the world. The most important Arab representative to the conference, Feisal Hussein, would not receive the welcome that he hoped.. . . Both Japan and China would send representatives to the Paris Peace Conference. Their situations coming into the conference could not have been more different, but they both left disappointed.. . .
One of the major topics for discussion at the Paris Peace Conference was the League of Nations.. . . The British would play a big role in the negotiations at Versailles, and they would be led by Lloyd George who would be one of the four individuals on the Supreme Council, which would make most of the larger decisions at the Conference. Another of those individuals was President Wilson,. . .
After the fighting had stopped, it was time to decide what the peace would look like. For this task representatives from all over the world gathered in Paris in early 1919. They all brought their own beliefs, hopes, and hatreds and in Paris they would hash out what would be. . .
With the armistice coming into effect on the Western Front on November 11th, 1918, the fighting in Western Europe would be over. For the centenary I jumped into the list of listener questions once again to discuss topics ranging from the contributions of smaller countries that joined the war near. . . This 2017 Patreon episode covers Spain, a country that technically stayed out of the war, but which still felt its effects. This is the second of two Patreon Preview episodes before the lengthy series of Paris Peace Conference episodes begins in late November.. . . This 2017 Patreon episode take a look at a near constant fact of life on the Western Front, Trench Raids. This is the first of two Patreon Preview episodes before the lengthy series of Paris Peace Conference episodes begins in late November. iTunes RSS The History of the Great war. . . The Great Influenza would spread around the world in 1918 and 1919, and leave destruction in its wake.. . . In 1918, as war raged in Europe a new, more deadly foe joined the battle.. . .
After the signing of the armistice the German Army and Navy had to come to terms with what came next.. . .
November 11th. The End.. . .
Why did the leaders of Germany and Austria-Hungary need an armistice? What did they try to do to keep their countries together?. . . This is our final episode about the military conflict at the front before we shift gears next episode to discuss the events around the armistice. This is something of a milestone because it is the last episode for the foreseeable future that will focus solely on military events, or at. . .
We now enter the last two episodes of our series on the 100 days, the final Allied offensives of the war. Today we will be looking at the allied offensive effort which began in late September and which would run, with few breaks until the end of the war. During. . . This will be our third and final episode about the American led Meuse-Argonne offensive. We will cover the entire month of October and then the beginning of November, right up to the armistice. During this time the French and Americans would continue to launch attacks in the Meuse-Argonne region with. . . This week the American attacks in the Meuse-Argonne offensive continue, but we also take a bit of a break from the larger story to focus on a much smaller one. When the attacks would continue in the first week of October there would once again be many failures, but there. . .
Last episode we discussed the American attack at St. Mihiel, this week we will focus on their attack during the Meuse-Argonne offensive. It was here that Foch had tasked the Americans with attacking through and round the strong German defenses within the Argonne forest with the goal of capturing the. . . This is our fourth episode covering the Allied offensives that ended the war, and this episode will be the first of I think 3 that will focus almost solely on the American Expeditionary Force. The American army had been growing in strength, capabilities, and confidence for over a year by. . . The Allies would have to determine how best to carry forward their attack and how best to capitalize on their previous success. We will cover the continuation of the attack at Amiens all the way until its conclusion. After the attack was halted around Amiens the Allies would broaden their. . .
Last episode we discussed the end of the German offensives and the beginning of the Allied counter attacks beginning with the Second Battle of the Marne. This episodes those attacks continue, this time with the Battle of Amiens. At Amiens, on August 8th troops from nearly all Allied countries, and. . . This is it, the start of the last big series of episodes before we arrive at the armistice on November 11th 1918. Over the next 9 or so episodes we will see the German offensives come to an end, the Allied counterstroke on the Marne, and then the general attack. . . Question Time! In which we answer some questions from some listeners. Be sure to send in your questions to get them answered. iTunes RSS The History of the Great war is also available on Stitcher Transcript Let's jump right in with the first question from listener Andrew: &quot;My question. . . This episode represents our last on the German Spring offensives. We are going to spend the first half of the episode focusing on some of the first actions of the American Expeditionary Forces, when we will move on to discuss the last two German offensives which would be codenamed Operation. . . This episode continues our series on the German Spring offensives of 1918 and after the first two attacks, Michael and Georgette, targetted the British for thei third effort the Germans would move south. This meant an attack against the French, and it would have the code name of Blucher-Yorck. This. . .
Last episode we wrapped up our story of Operation Michael, the first of what would eventually be 5 German offensives in spring and summer 1918. This episode we continue past Operation Michael and to do so we will split the episode into two pieces. The first of these will discuss. . . This is our sixth episode on the German spring offensives of 1918, last episode we discussed the events of Operation Michael after the first day of the attacks, we discussed the decisions made by the Germans on how to carry their successes forward and the scrambling by the British to. . . This is a story that I knew absolutely nothing about until about two years ago when I stumbled upon it while researching for the Russian Revolution episodes last year. It is the story of Czech, Slovak, and other eastern European soldiers as they journeyed, quite literally, around the world. At. . . This is our fifth episode covering the events of the German Spring offensives, and last episode the first major German attack on the Western Front, Operation Michael began. Throughout the day on March 21st the German troops had moved forward and for the most part they had done quite well.. . .
For almost 4 years the western front had been mostly static, but all of that was about to change. For almost 4 years both sides had been throwing themselves at the other without much success, but with Operation Michael the Germans would finally change the map in a drastic way.. . .
After our first two episodes discussing the general state of the three armies on the Western Front in early 1918, in this episode we get down to details. First we will look at some of the final orders given for the offensive before looking at preparations behind the front. Then. . .
Last episode we discussed a lot about the German plans for 1918, this episode we shift our focus over to the situation of the Allies at the beginning of the year. Before I talk about it for the next half hour, we can summarize the situation for the British and. . . This episode begins a two month series of episodes on the German spring offensives of 1918. Between March and July 1918 the German army would launch five major operations on the Western Front. They would be launched the following order, one note throughout the series I will refer to them. . . In this episode we will once again be discussing the war in the air. I would describe this as something of a random topics episode. We will of course be discussing the role of the air forces of Europe in 1918, but we will also be digging into some other. . . This is the first of at least 3 episode dedicated to listener questions for this year. Thank you to Patrick, Mike, Andy, and Owen for the questions this time. iTunes RSS The History of the Great war is also available on Stitcher Transcript Hello everyone and welcome to History of. . .
Over the last two episodes we have discussed the events on the Italian front during 1918. In this episode we will conclude our story of the Italian front by looking at the last week of the war for the Austro-Hungarian Empire and then dig into what happened after. We will. . .
Last episode we set the stage, on both sides of the line, for the actions of 1918. The Italians had just experienced a disaster at Caporetto, but they were recovering, the Austrians had just won a tremendous victory at the same battle, but they were having issues repairing their broken. . .
We last visited the Italian front with the Austro-German attack named the Battle of Caporetto. In this attack the combined forces of Germany and Austria-Hungary had broken, at least temporarily, the stalemate that had kept the Italian and Austrian troops locked on the Isonzo and on the Asiago plateau since. . . This week we take a look at the post-war Middle East both at Versailles and after. I want to start off by saying that this is not the only time we will discuss the decisions and actions at Versailles as they related to the Middle East, however I did think. . . This is our fifth episode in our chronicle of events in the Middle East in the last two years of the war. Last episode saw the British troops advance out of Egypt and into Palestine where they were stopped by Ottoman troops at Gaza. This episode will see a new. . .
Over the last 3 episodes we have discussed the events in the Caucuses, in the Hejaz, and in Mesopotamia. Today we shift our focus to the fourth area of major operations in the Middle East in the last half of the war, the southwestern portion of the Ottoman Empire which. . .
During the last two episodes we have tracked the creation and events of the Arab Revolt in the Hejaz, in modern day Saudi Arabia. Today we will pull away from that story to catch up with events in two other areas of the Ottoman Empire. We will begin far from. . .
Last episode we discussed the start of the Arab Revolt in the Hejaz, modern day Saudi Arabia, and this week we will follow that revolt through to its end, or at least until its stopping point until the British began advancing out of Egypt. After we wrap up that story. . . The planning for the Arab Revolt started right from the beginning of the war, and because of this a critical piece in its creation was the estimations of the Ottoman Empire by the British when the war started. This is before Gallipoli, before Kut al-Amara, really before the British got. . . This episode is just a quick overview of what we will be discussing over the next 40 or so episodes over the coming year. I will also be introducing some questions that we will be trying to answer over those episodes. The final year of the war would be very. . . The Third Battle of Ypres, or the Battle of Passchendaele as it is sometimes called, has become synonymous with one thing, mud. Most of the battle would be fought in situations that seem completely impossible, and yet the British army persisted in the attack. Of course, attacking through mud that. . . It has been a crazy year, for everybody who supports the show on Patreon, likes the page on Facebook, follows it on Twitter, or just listens to the episodes. Thank you. This post is about both looking back at the last year and also looking forward to 2018 and what. . .
After the attacks on the Chemin des Dames in the middle of April 1917 the French army would go through what they would at the time term acts of collective indiscipline, they are known to history as the 1917 French Mutinies. These mutinies would occur in 4 phases in the. . .
After the attacks on the Chemin des Dames in the middle of April 1917 the French army would go through what they would at the time term acts of collective indiscipline, they are known to history as the 1917 French Mutinies.. . . This is our fourth and final episode on the Nivelle Offensive of 1917 and will also be quite a bit shorter than the previous two episodes. Today we will cover what happened after the first day of the attacks on the Front. After these attacks fail we will transition to. . . This week is our third episode covering the Entente Spring offensives of 1917, and in this episode the attacks will begin. We are going to break down the attack into two areas, the first will be on the British area of the front, an area that would include the Battles. . . This week we continue our story of the French and British 1917 offensives. Last episode we focused mainly on the planning that occurred in late 1916 and early 1917 that would setup the events for the rest of the year. These discussions between the French and British military and political. . .
Today we begin a long series of episodes to finish out the year, all focusing on Western Front during 1917. I will be honest and say that I have held these until the end of the year because I was suffering from some serious Western Front fatigue at the end. . . This episode is our third and last detailing the air war of 1916 and 1917 with our focus today being on the events of 1917. This penultimate year of the war would be in some ways the height of the air war. It had taken all of the belligerents several. . . This is our second episode on the Air War over the front in 1916 and this week we will be focused solely on the air battle over the Somme. For the British, 1916 would be defined by the Somme, both on the ground and in the air. While the French. . . This episode sees us once again going back in time to 1916, and while we are there we are going to talk about the air war over the Western Front. The last time that we talked about the war in the air was way back in our 1915 episodes, which. . . This is our fourth and final episode on how America entered the war in 1917 and what happened for the rest of that year. During this episode we are going to touch on what the Germans, French, and Austro-Hungarians thought of America's entry into the war and then we will. . . This is our third episode on America's path into the war. Last episode we discussed America's road from neutrality in February 1917 to the declaration of war in April 1917 and this week we will be primarily concerned with what the planned to do now. There were several items on. . . This is our second episode on the path of America entering the war and last episode we covered some of the actions of the American government before 1917 and then discussed the Zimmermann telegram in depth. Today we will take up our story from that point. Our two big topics. . . This is the first of our four part series on how America entered the war. Before 1917 the United States was the capital G Great Neutral. The industrial and manpower base that the United States had access to could turn the war in anyone's favor, but to do that the. . .
Last week saw the beginning of unrestricted submarine warfare for the Germans and throughout the first few months the campaign went quite well, with April 1917 being the best month of the entire war for the German submarines. However, no act, especially one involving hundreds of thousands of shipping tons. . .
Last episode we discussed the German submarine actions of 1916 and some of the technological changes that occurred during the war as it related to the U-Boats and the British attempts to get them under control. This week we are solely focused on perhaps the most important event of the. . . This week we begin a three episode series on the underwater war at sea, and that means a lot of discussion about U-boats. It has been a long time since we talked about U-Boats, Episode 59 by my count and in that episode we left off the story with the. . . This week we come to the end of our episode on the Russian Revolutions, and in general the state of Russia during 1917. This will also probably be our last episode focusing on the events in Russia during the war since one of the big topics for today is how. . .
We come now, finally, to the most famous event in 1917, at least as far as Russia is concerned, the October Revolution. Even though the February Revolution had ended hundreds of years of Tsarist rule, and brought something approaching democracy to Russia, it is often overshadowed by the revolution that. . . This week we bring our attention out of Russian politics and back to the war. Once things had begun to settle down in Petrograd and the rest of Russia, with the Provisional Government now mostly in control, everybody's mind turned back to the war. The most important area of focus. . .
Last episode saw the February Revolution sweep through Petrograd and the abdication of the Tsar. This week we are going to look at the fallout. With the overthrow of the Tsar and his government the question very rapidly became what, and who, to replace it with, a question that would. . . This week is our second on the turmoil in Russia during 1917. the first revolution of 1917 was a textbook case of a spontaneous and unplanned action by a massive number of people within Petrograd, the capital city of Russia previously known as St. Petersburg. The leaders of the future. . .
We start today at the beginning of 1917 at which point at least the Russian military leadership was somewhat positive about what they thought they could accomplish in 1917. In reality if the revolutions had not happened there is a good chance that the Russians would have been a highly. . .
Last episode saw the Germans join into the fray on the Italian front. They joined the Austrians to launch an attack that would be named the Battle of Caporetto. After firing their artillery, a good number of which were gas shells, the combined Austrian and German army attacked. In response. . . This week we come now, at last, to something that I have been referring to during all of these episodes on the action on the Italian front, the Battle of Caporetto. Caporetto was the climax of the fighting on the Italian Front during the war, I think it actually occupies. . . Welcome to 1917 as we have finally arrived and we are going to jump right into the action. Today we will be discussions the 10th and the 11th, and last, battles of the Isonzo. These would be the only two Italian attacks during 1917 and they would set the stage. . . This week we will start off by discussing the 9th Battle of the Isonzo, which would be the last major action on the Italian front for 1916. It had been a year of several offensives and this one would not look that much different than the previous 2 Italian attacks,. . . This episode we will be looking at another attack on the Isonzo when the Italians launch what will become known at the 8th battle. This time the Austrians would once again be pushed further right up to the breaking point however, they would also once again barely manage to hold. . .
Today I had the privilege of speaking at the Memorial Day commemoration event in Nixa Missouri to honor all of the servicemen and women from Christian County Missouri who served in the First World War. I am always honored to be involved in this kind of events, and it is. . . This episode is our second on the Italian front of 1916 and this time we are headed back to our familiar stomping grounds, the Isonzo, where the Italians will launch two more attacks against the Austrian defenders. These attacks would be slightly different than those that had come before because. . . This week we jump into a place that we have not discussed for a few years now, the Italian front. Our last visit to this front was way back in Episode 47 which basically feels like ancient history at this point. The plan was to catch back up on the. . . This week we are back to Romania and when we last left the theater Falkenhayn had advanced into the mountain passes over the Carpathians and in the south Mackenson had turned back the Romanian attack across the Danube. It was from these positions that the Germans, Austrians, and Bulgarians would. . . This week is something of a special episode as we will break from our usual programming to instead discuss something that happened 100 years ago, the Battle of Vimy Ridge. This battle occurred between April 9th and 12th 1917. This action would be part of the larger Battle of Arras. . . This is the third episode on the Romanian campaign, or as I like to call it, the first part in a two part episode called Romania's No Good Very Bad Time. Last episode the Romanians had invaded Transylvania, advanced around 100 kilometers from all sides and then did, precisely, nothing.. . . This is our second episode on the Romanian campaign. Last episode we looked at the run up to the war and the terms under which Romania entered on the side of the Entente. Today we will talk about what Romania planned to do with the army that it mobilized ty. . . This week we begin a new series though, four episodes on the Romanian campaign of 1916. Romania would not enter the war until late in 1916, their path to this decision to enter the war was long and winding with the negotiations with the Entente taking many twists and turns.. . . This will be our fifth episode where we end up talking a lot about food, but this one will be a bit different. Over the course of the last few years I have gathered a bunch of random notes on what the soldiers at the front were eating during the. . .
You can support the podcast by purchasing the book directly from the publisher by clicking the image above or by clicking here Victory or defeat would hinge as much upon which side could keep their troops in the field supplied and fed – whilst at the same time avoiding starvation on. . .
our fourth and final episode on our tour of the homefronts around Europe, today we will be branching out a bit in our topics. We will start by discussing Italy by discussing just the general state of their society and why there was unrest that would built toward the end. . .
Last episode we looked at the food situation in Germany during the war and this episode will begin by looking at Germany's two most important allies, Austria-Hungary and the Ottoman Empire. Austria would be in a position similar to that of Germany, although it would in general be far worse,. . .
Last episode I said we would be focusing on the food situation in the Central Powers this week, but push came to shove and it turns out that I had more to say just about Germany than I expected, therefore this episode will be just about the food situation in. . . This week we begin what will be 4 episodes of looking into what was happening on the homefronts around Europe during the war. The war was a long, hard, struggle and that struggle did not just encompass the soldiers at the front but instead the entire continent of Europe. The. . .
Last week we discussed three random topics, and this week we will cover a few more things that I also could not find a way to fit into other episodes. Unlike last episode where I felt that we were all over the place in terms of topics the items on. . .
For this episode we will be starting off the year with a few random topics that are from 1916 that we did not get to before. These are items that were always on my list but that I also did not feel needed an entire episode to discuss. Because of. . . In our third episodes discussing railroads during the war we discuss a prewar engineering project that sought to build a railroad through the Middle East from Constantinople to Baghdad. To get access to this episode, subscribe to the the History of the Great War Patreon campaign:. . . This week we come to the end. This will be our 14th and last episode on the Battle of the Somme as we look at the last two month of fighting in October and November. These would be rough months for all involved not just because of the continued casualty. . . In the second part of our series on the railroads of Europe during the war we talk about the British railways, one of the greatest rail disasters in history, and some specialized railroads used during the war. To get access to this episode, subscribe to the the History of the. . .
Our story today begins in September as the Battle of the Somme enters its third month and while the fighting would continue all the way until November this would be the month of the last large British and French offensives in an attempt to break the German line. It would. . . Thanks for thinking about filling out the listener survey. The link below will take you to Blubrry where you can complete the survey. It is only 10 questions, so it should only take a moment or two. Survey Link. . . This week we take our Somme narrative out of the fateful month of July and into August. In his book The Somme: Darkest Hour on the Western Front Peter Hart would say that "In some ways the study of August and early September is the least rewarding and most utterly. . .
About a month ago I reached out on Facebook, Twitter, and Patreon to try and round up some questions or topics that listeners would like discussed and that resulted in a list of about 7 topics to be discussed today. They are sort of all over the place but I. . . This week is our 11th chronicling the battle of the Somme and we move onto the next set of attacks during the last 8 days of July which would be launched by the 4th Army with the assistance of the Reserve Army under General Gough. This would also be the. . . In the new premium episode we look at the development, and the challenges, of the French and German railways in the century before the war. This will be the first in a three part series looking at maybe the most important piece of the entire war, the railroads. To get. . . This week we move onto what was sort of the second big attack on the Somme, or the second big British effort anyway, which would take place on the 14th of July. While not as big as the first attack on the 1st it would sort of set the template. . .
Last episode we discussed a bit about the early developments of the tank before it went into battle in September 1916. This included the early designs and changes to what would become known as the tank, some of the production difficulties, and then how they were sent to the front.. . .
With the 100th anniversary of the appearance of the tank on the battlefield in September 1916, we look back at the evolution of the tank from the ridiculous designs on a drawing board to the somewhat disappointing machine that made its debut on the Somme. To get access to this. . .
After July 2nd the first attacks on the Somme were over, but there were more planned and they would happen very soon. The British did need a few days to catch there breath and put things in order, and for the next two weeks they would be launching attacks that. . .
Last week we covered the last of our episodes on July 1st 1916, that means that this week we will take a step back and do a bit of an appraisal of everything that happened on that day. We will start off today by just talking about some basic numbers. . . This will be our last episode detailing the events of July 1st, 1916. It has been several now, this will be our 4th. In the first three episodes we discussed little but completely failures for the British as they tried to move forward against the German defenses. This week, in. . .
Today we continue our story of the attacks during the Battle of the Somme on the first of July 1916. We continue our journey south by looking at the attacks of the third and fifteenth Corps of the 4ths army in their attacks from just north of the village of. . .